One Of The Most Versatile Storage Solutions On The Market! Easily take home your club purchases in the super-durable trunk organizer that holds up to 100-lbs! Trunk Organizer Pro installs in seconds - literally. Simply hook the adjustable straps to your car and you're done! Tired of stuff rolling around your trunk? Bags never stay in place and one sharp turn can spill your purchases. Even keeping tools and auto supplies neatly stored is a tiresome task. Luckily, there's Trunk Organizer Pro, the eco-friendly, professional grade heavy-duty trunk organizer. READ FULL DESCRIPTION Trunk Organizer Pro is super easy to install. Simply hook the adjustable straps to your car for a secured fit. Made with premium Oxford polyester material, Trunk Organizer Pro is water-resistant and abrasion-resistant - perfect for groceries, pet supplies, tools, water bottles, sports equipment, and so much more. 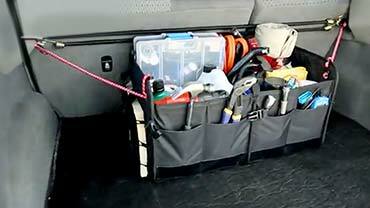 Unlike other trunk organizers with only one compartment, Trunk Organizer Pro lets you customize your organizer. There are two removable sub-dividers that you can adjust to hold your things just as you need. Plus, four exterior compartments give you quick access to essentials that you use frequently. And the organizer holds up to 100-lbs.! When you need to free up space in your trunk, Trunk Organizer Pro folds completely flat for super-easy storage. It's the most versatile trunk organizer you'll ever use! Get your Trunk Organizer Pro now for only $39.99 plus FREE S/H. But wait - double your offer and SAVE on a SECOND Trunk Organizer Pro for even MORE storage and organization. Just pay a separate fee of $9.99. This offer isn't available in stores, so order now! Collapses Completely Flat & Holds Up To 100-lbs.